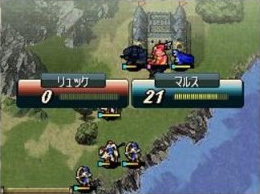 A remake of Fire Emblem: Monshō no Nazo on the Nintendo DS. The game introduces a new player-customised character known as the Hero of Shadow, around whom a new series of prologue and side story chapters are centered. The game also features chapters from the rare BS Fire Emblem: Akaneia Battle Collection on Satellaview. Players can also connect to the Nintendo Wi-Fi Connection to battle other players online, loan characters to other players, access an online store to purchase items with money acquired in-game and download exclusive episodes.